This highway 280 project work was performed in order to help alleviate traffic congestion. All of the work was performed at night and was under a set deadline for completion. The project was approximately 8.2 miles in length from Hollywood Boulevard in Homewood to Alabama Highway 119 in Hoover. 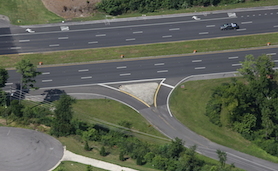 The bulk of the work was performed in the median of the Highway in order for intersection reconfiguration and U-turns. The schedule for the different scopes of work was orchestrated for removals, grading, asphalt paving, new concrete curbs and islands and more asphalt work. The final project was then overlain with a final asphalt wearing surface and permanently striped in its final reconfiguration. New traffic signals with camera detection were installed to complete the project. Other scopes included drainage improvements, solid sodding and landscaping, retaining walls and guardrail. This project included intersection improvements, widening for turn lanes and traffic stripe and traffic signals. This work was completed approximately 30 days ahead of schedule and won an Alabama Asphalt Paving Award.